God is on mission to make the world more loving and more just. The church’s mission is to participate in God’s mission to make the world more loving and more just. Each of the baptized is committed to participate in God’s mission to make the world more loving and more just. as well as church and its ministries of outreach and service. to find a teammate for support in carrying out each current daily mission. Member mission teaches the baptized to see themselves as missionaries out in the world in each of their daily places doing God’s work with Jesus’ help and guidance. In today’s world, the most effective agents of God’s mission in Jesus Christ are each of the baptized in their daily places – at home, at work, in their local communities and the wider world, in their leisure time, and their spiritual health, as well as in their church life and outreach. These daily places are their daily mission fields. To live this way, they need support and education. Therefore, congregations need to take on as their primary purpose, or one of their primary purposes, supporting their members in their daily living as Christians on mission. Member mission’s goal is to help each baptized person to join in God’s mission in the world 24/7/365. Sunday is to help them to do it better. Following the furor of the past decade which has been so fixed on the church rather than on God’s mission, centering on the daily missions of each member is surely the next step for all of our churches. Member mission is a way for the whole church to become missional. Member Mission Network, Inc. is a non-profit corporation formed to disseminate and implement the concepts of member mission. 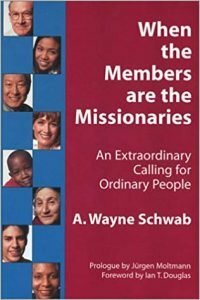 The work is underpinned by research summarized in When the Members are the Missionaries: An Extraordinary Calling for Ordinary People. The concepts presented in the book are currently being implemented by churches and seminaries and have resulted in workshops conducted throughout the United States and Canada. Lessons gleaned from these workshops and churches working with member mission have led to a number of tools included in a workbook entitled Living the Gospel: A Guide for Individuals and Small Groups. Member Mission provides many tools including a website (www.membermission.org) with Life Apps, podcasts, videos, stories, discussion starters, basic tools, and sermons assist individuals as well as congregations to better understand and live out the member mission vision. The overall goal of all of these activities is to provide churches and individuals with the strategies and tools they need to enable each member to join in God’s mission in each of their daily mission fields.